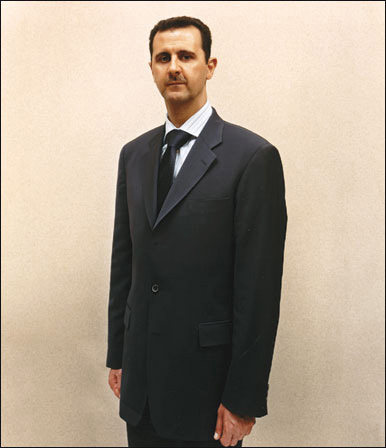 Next, the head of the regime – President Bashaar – enjoys a degree of genuine popularity. It’s the regime’s body – Bashaar’s corrupt cousins, and the stalwarts of the security services – who are much more fiercely hated. There is therefore no chance that the military will sacrifice the leader to placate the people, as happened in Egypt. At the turn of the millenium Syrians accepted Bashaar’s inheritance of the presidency from his father as the least worst option: it prevented a recurrence of the tank battles between rival generals which had characterised Syrian politics before Hafez al-Asad’s ruthless stabilisation of the country. Beyond that, young, mild-mannered Bashaar was seen as possessing hands clean of his father’s era’s crimes. Even if his promised Damascus Spring rapidly fizzled out, he was generally given the benefit of the doubt. The failure to reform was blamed first on the regime’s persistent old guard, and then, with turmoil gripping Palestine, Lebanon and Iraq throughout the Bush years, on the perilous regional environment. Finally, unrest has been kept under wraps by pervasive repression. While Egyptians had some ability to organise politically and to publically criticise state policies, the Syrian regime allowed no space whatsoever for dissent. Whenever discontent had bubbled to the surface in the past, it was violent, and was met by even greater violence. The slaughter of tens of thousands in rebellious Hama in 1982 traumatised a generation. In comparison, the repression of the Bashaar years felt gentle. Yet Syria houses the same explosive brew that brought change to Tunisia and Egypt: social stagnation, a young population, a precarious economy. And now the nearby revolutions have changed everything. Suddenly it seems possible for Arab democracies to promote nationalist agendas; indeed the West would find it far more difficult to dismiss the empowered anti-imperialist and anti-Zionist voices of a democratic Syria. And if Arabs elsewhere could insist on their dignity, why should Syrians continue to put up with the regime’s casual barbarity? One example of this – a friend of mine was arrested and tortured not because he had committed any crime but because the authorities wished to squeeze out of him the location of one of his relatives, who was guilty of small-scale embezzlement. When my friend was released, his mother didn’t recognise him. His head, she said, had swollen to double its normal size. On Tuesday, hundred of thousands of Syrians demonstrated in support of the regime. Many were dragooned state sector workers, but many others demonstrated out of conviction. They certainly outnumbered those who have protested for greater freedoms, but this is no cause for regime complacency. We can be sure that that the protesting crowds would be far larger if they didn’t face the risk of being ripped apart by exploding bullets. As well as organising loyalty demonstrations, the regime appeared to be on the verge of meeting many of the reformists’ demands. Al-Asad’s cabinet resigned. Presidential advisor Boutheina Sha’aban and Jihad Makdissi at the London embassy announced that the state of emergency would be ended. Former foreign minister Farouq ash-Shara’a told Hizbullah’s al-Manar TV that the president would make a speech that would please everyone. And yesterday Bashaar finally addressed the nation, via a speech to his tame parliament. Frequently interrupted by the delegates’ choreographed declarations of loyalty, he admitted that reforms have been too slow coming but promised that they would come now. He seemed to suggest that the state of emergency would finally end, at some point, in some way or other – but only through hints and implications. He didn’t spell out what this would mean for the country’s media or political life, or for its political prisoners. He gave no time frame for reforms, but stressed that they should not be overly hasty. And he undercut the vaguely positive aspects of his speech by rehearsing the “conspiracy” line – as if the people of Dara’a needed foreigners and traitors to tell them that the arrest of their children was an injustice, or that the real traitors are those who open fire on their unarmed compatriots. Mixed in with the brutality, the Syrian regime has often proved itself highly adaptable to changing circumstances. But not during yesterday’s speech. Bashaar missed his (already very belated) historical moment, revealing himself to be a cold and unimaginative operator. The president appeared to be in a state of denial. He appeared to enjoy the parliamentarians’ false applause far too much. He came across as an archaism in this new era, as a dinosaur. This doesn’t necessarily mean the regime is about to fall, but it does mean there’s a great deal of trouble ahead. Which spells disaster for Syrians of all backgrounds, as well as for anyone who cares about Syria’s vital regional role. A dangerous time for us all. I felt depressed after listening to his speech and the future did not look good for Syria at all. Let us see what happens this Friday, as that is the usual day for launching protests. I think Bashar is actually stupid because if he were to implement reforms and allow people to vote freely, people would probably vote for him. They don’t know anyone else.. Assads ruled Syria for decades. Syrians are not risk takers. However, the authorities dealt very violently with the protesters and this is going to propagate the mistrust people always had with their government and will have long term consequences.